Yes. It’s time to talk about the ‘most wonderful time of the year’: Christmas. As the Head of Marketing Europe for Bing Ads, I like that season because I see mushrooming under my tree insights from different markets across the region. As someone who not only indulges on chocolate log cakes but also on cultural differences, I always know that I am up for a treat. Let me unwrap some of these nuances which could help you plan more efficiently your advertising campaigns across Europe. Five years ago had you asked a member of the UK general public what Black Friday was, you would have probably got a blank look and a very French shrug. Today if you were to ask the same question you would receive knowing enthusiastic nods of acknowledgement, and maybe a hint of anticipation. As nicely recapped by fellow-contributor Sam Noble, only since Christmas 2013 when ASDA experimented with their first Black Friday deals, has the concept of Black Friday taken root in UK shopping culture. 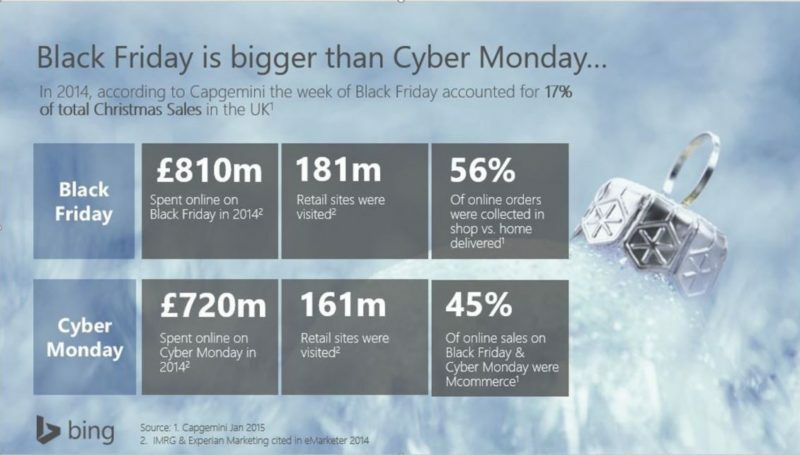 According to CapGemini, the week of Black Friday last year made up 17% of the total Christmas Sales in the UK. This fact only is an indicator of how important it is to take advantage of the timing and prepare ahead for any upswing in retail activity. Remember, Black Friday this year takes place on the 27th November and Cyber Monday takes place on the 30th November. 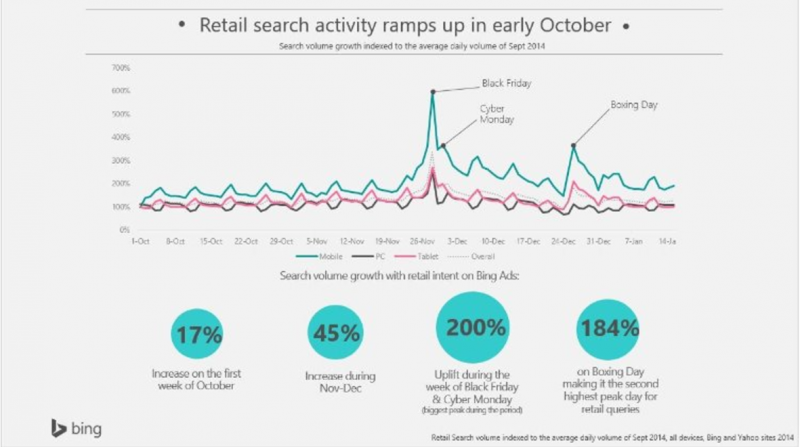 The above chart shows an analysis of the overall retail searches indexed to the average daily volume in September 2014 for all retail queries, including all retail sub categories. 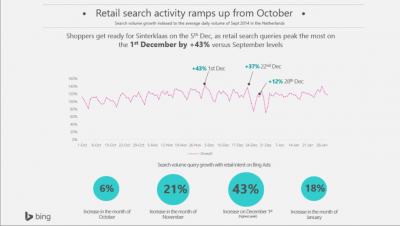 Search queries start to accelerate in the first week of October, however retail really starts to kick off during the months of November and December as the number of queries increases 45% for the final two months of the year. 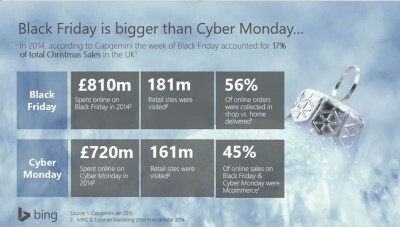 We see an uplift 2 times the relative average in September during the week of Black Friday and Cyber Monday – the biggest peak of the season in the UK so watch out for thee big days! Black Friday is a big day for mobile users with peaks up to 6 times the mobile average in September. The first week of January also sees an uplift of nearly 25% in terms of retail queries, perhaps due to the sales in the new year. German efficiency, French laissez-faire… Different time relationships. 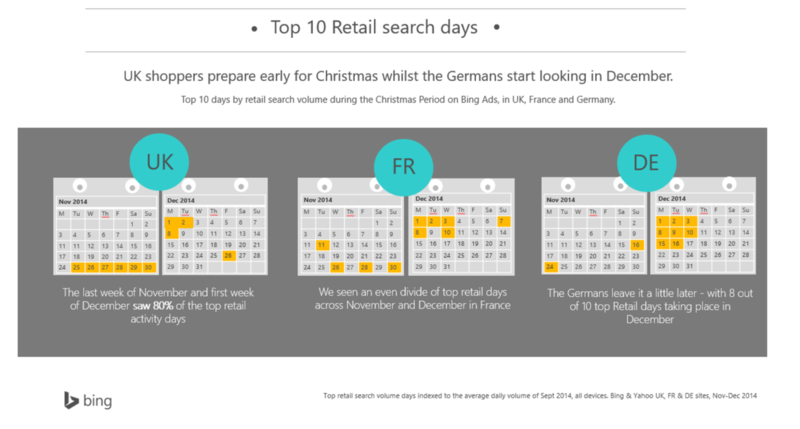 When looking at historical search logs, we realize that the Germans leave their Christmas shopping a little later then the Brits, with 8 out of 10 top Retail days taking place in December. The first two weeks of December are the busiest shopping times. 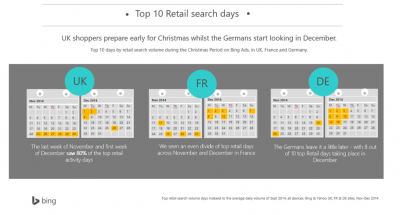 However, unlike the Brits who get excited about Boxing day, the Germans tend to unwind for the Christmas period from the 3rd week of December as online activity remains low until the beginning of January. In the Netherlands, Christmas comes early. Almost a month early in fact. The Netherlands offer some interesting nuances in its seasonality. Overall, we do see that retail search activity starts to ramp up in early October above September levels. 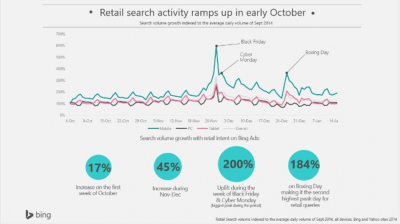 An interesting trend however, on the 1st of December search queries peak the most (+43%) versus September levels. As Sinterklaas takes place on the 5th Dec, shoppers are clearly preparing and getting ready for the ‘Pakjesavond’ (present evening). Online activity falls whilst everyone is celebrating family time and picks back on the 7th Dec.
From the 22nd Dec, retail searches are up 37% from Sept levels as shoppers search online last minute before they start to unwind during the Christmas week. Searches fall dramatically during the week of Christmas, as the Dutch celebrate Christmas Day and Saint Stephen’s Day. Interestingly enough, this is very different activity to those in the UK where the 26th sees the largest search activity in those countries because of Boxing day sales. Whilst Saint Stephen’s Day (26th) is celebrated more, online activity remains low during the week as the Dutch are off their devices and focus on family time. When looking at such nuances, the seasoned search marketing managers will have the reflex to ensure that their search budget are sufficient to cope with the additional influx of traffic, but also to refine their ad copy to capture the momentum with time-sensitive variation. They also know that this may be a more competitive environment as usual, so they should monitor their ad position and adjust bids to maximise click volume and CTR. But no matter your level of expertise, you may be after a few tips on how to seize fully this opportunity. We have thus recapped optimization tactics and in-depth retail trends for your campaign in some Christmas insight decks for the UK , Germany, France and the Netherlands. Enjoy the reading… Oh, Oh, Oh!